Another year has come to an end. I wanted to take a moment today to look back at the goals I posted last January in my "Look ahead: 2011" post. I'm proud to be able to say we completed all but one. Progress: 495/990 - Only missed this one by a few. Our current total for our signed 08 Topps set sits at 469/990. Not bad. 2008 Topps Gold Border Parallel - COMPLETED! We easily surpassed a dozen and currently have 18 signed 2008 Topps Gold Border Parallel cards. Player Collection - COMPLETED! This one was easy. 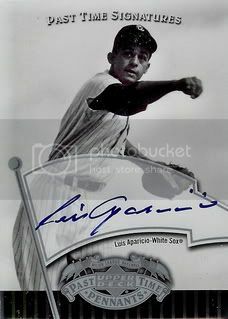 We officially launched our Luis Aparicio player collection last April and have had 32 Lil Luis-related posts. Have a Contest - COMPLETED! Remember when we gave away that box of 2010 Bowman Chrome? Seems like a long time ago now. Keep My Blog Alive - COMPLETED! 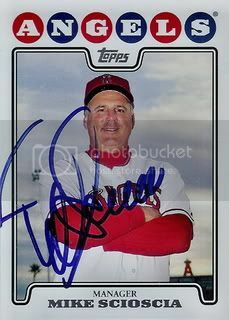 There were at least three times the past few months when we went for more than two weeks without posting but My 2008 Topps Set Blog is still around. 2011 was another good collecting year. A lot of the stuff I buy doesn't make it's way to the blog. 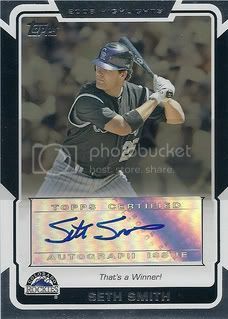 I've been posting a lot of non-2008 Topps stuff lately and I expect that to continue into 2012. I've actually had my eye on this card for awhile. It always seemed to go for a little more than I was willing to spend. I like Jeff Salazar and he did some good things for the Diamondbacks in 2008 but I knew if I waited long enough I'd get one for a buck or two shipped. 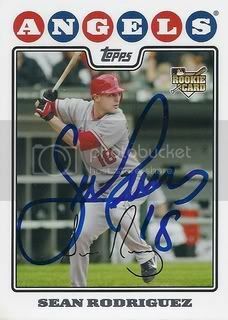 My patience paid off and now this autograph is part of our 2008 Topps collection. 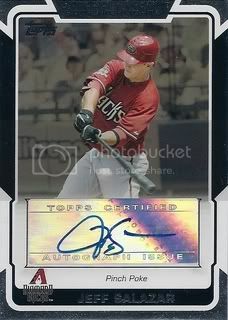 Hey we just posted the card Seth Smith signed for our base set earlier this month. Now we have his certified auto. Isn't that great? 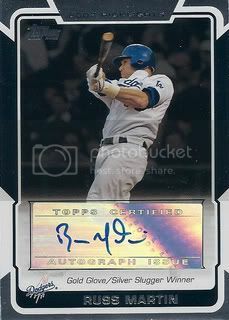 Here's a good example of what Topps can do with the shiny stickers they have had players sign. 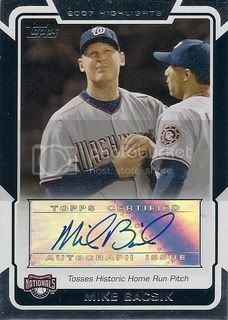 I'm sure Mike Bacsik never would have guessed his sticker would end up on a card commemorating a home run that he gave up. I'm sure it's a memorable moment but probably not one of his career highlights. 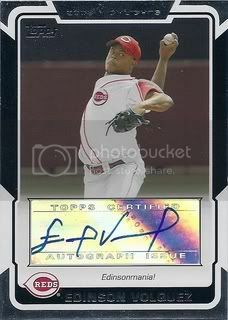 Next up in our stack of 08 Topps certified autos is Cincinnati Reds starting pitcher, Edinson Volquez. Not too long ago it looked like this guy might be a star. He was even an All-Star in 2008. That was before the suspension for performance-enhancing drugs in 2010. He hasn't been quite as good since. Last week, he was traded to the San Diego Padres. Maybe I'll see him during Spring Training. I hope so because I still have his All-Star card from the Updates & Highlights set that I need to get signed. Every year when my wife asks me what I want for Christmas, she always brings up the fact that she would buy me baseball cards but doesn't know what to get. Completely understandable. Fortunately I have no problem with picking up a few things for myself. This year part of my Christmas present was a small stack of certified autographs from the 2008 Topps set. I'll be doing a post on each of them over the next few days. First up is former Los Angeles Dodgers catcher, Russell Martin. Russ has a pretty impressive resume. He is a three-time All-Star and has won both a gold glove and silver slugger award. I'm pretty sure this is the first autograph of his of any kind we have. 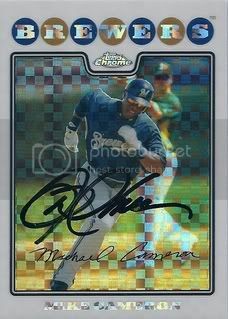 I've met Mike Cameron a few times during Spring Training when he was with the Seattle Mariners and the San Diego Padres. He has to be one of the nicest, fan-friendly players that I've ever seen. Mike came through for us again. This time he signed his Bronze Refractor from the 2008 Topps Chrome set. This one looks great signed in black Sharpie. It's numbered 137/599 on the back. Merry Christmas everybody! Santa brought me a few cards I'll be posting over the next few days. 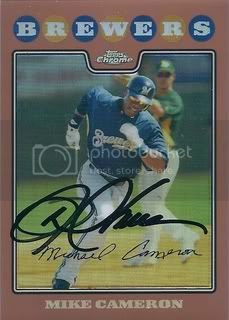 Got a nice return from former Milwaukee Brewers outfielder, Mike Cameron. Mike signed his XFractor from the 2008 Topps Chrome set for us. If you're keeping track at home, this is only our second signed XFractor. Part of Mike Scioscia's super team out in Los Angeles consists of this guy who won his first Gold Glove at shortstop in 2011. Yup, Erick Aybar might not have the biggest bat but his defense is superb. Any early Christmas present for myself? Why not! I picked up this Luis Aparicio autograph a few days ago. It's from the 2005 Upper Deck Past Time Pennants set. The base cards from this one are nice but the on-card certified autos are great! This one features a nice black and white photo of Lil Luis which makes the blue signature really pop. Man, this guy's going to have some fun next year. In addition to former All-Stars like Torii Hunter and Jered Weaver, Mike Scioscia will now get to manage Albert Pujols and C.J. Wilson. I still like the Rangers but it's hard to not say that the Angels are the team to beat in the AL West. 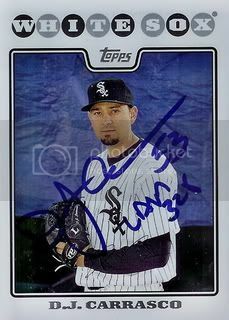 This signed card of former Chicago White Sox reliever, D.J. Carrasco came to us from our friend Raiderdan on SweetSpotGraphs.com. Another nice one. Thanks, Dan! I hadn't been to SSG in awhile and it looks like it may have been shut down. Anyone know? 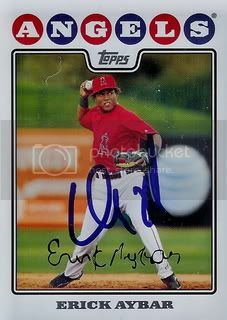 I've liked Yunel Escobar since I saw him play in the Arizona Fall League a quite a few years back. The Toronto Blue Jays locked him up with a long term deal last summer so it looks like he'll be a fixture in their infield for quite some time. We picked up our first manufactured patch card for our Luis Aparicio collection. 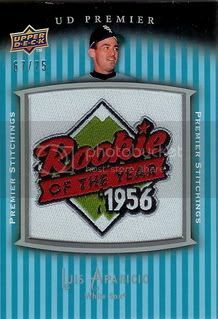 This one is from the 2008 Upper Deck Premier set and commemorates his Rookie of the Year award. Nice looking card and it's numbered 67/75. After another long span of no blog posts, we're going to do our best to finish strong. I need to catch up on some scanning but we've got plenty of great stuff to do posts on. 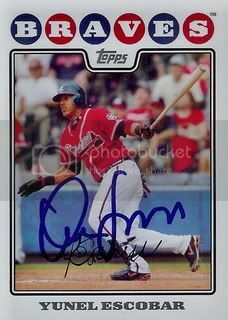 Here's another signed 08 Topps card for our collection. 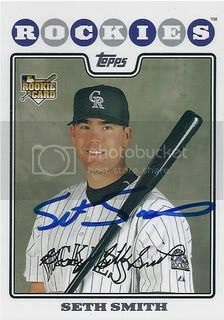 This one is of Colorado Rockies outfielder, Seth Smith. Sean Rodriguez is one of those super utility players. He's started a game at every position except catcher and pitcher. Pretty cool. We recently picked up this signed card from the 08 Topps set. I know I'm a little behind on this but I just heard the news ( Thanks, Brian ). One of my dad's all-time favorite players has finally been elected to the Hall of Fame. As much as I wish that Ron was around to enjoy it, I also wish my dad was here to share this too. He passed away over the summer and I'd really, really like to call him to talk about this but I can't. Instead, I'm sitting in front of his laptop and typing this post with tears in my eyes. My dad and I were able to meet Mr. Santo quite a few times and we have several of his autographs in our collection. I think I'll save those for July. 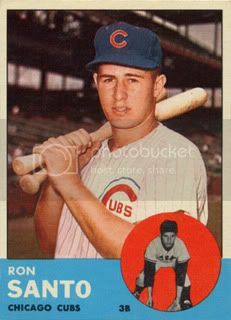 For today, let's enjoy his 1963 Topps card. Go Cubbies!